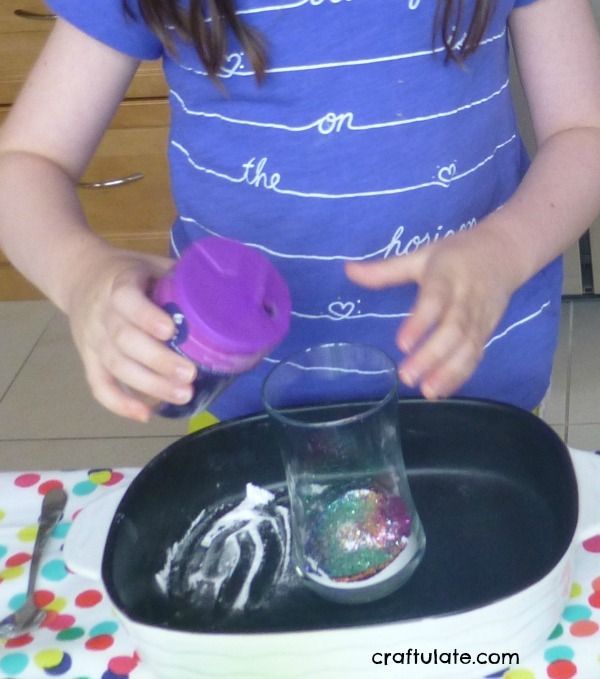 This sparkle science activity uses baking soda, glitter and vinegar to create a fun and exciting eruption! I had intended to prep everything in advance, but because the reaction between the baking soda and vinegar is over so quickly, I thought it would be fun to ask the girls to measure everything for themselves. I even made little instruction cards for them to follow! We read through the instructions together and the girls carefully measured all the ingredients. They loved that included glitter! Then it was time to watch the reaction of the vinegar and baking soda! It whooshes up the glass *really* fast! They loved it so much they wanted to do it all again, even helping me rinse everything out. This time they called the boys in who had been playing in the next room. The boys wanted in on this one! So we rinsed everything out again and the boys got their turn at measuring. Then everyone watched the eruptions! 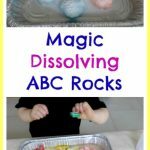 I am so pleased that this sparkle science activity was a success. I think they could have repeated it for hours! 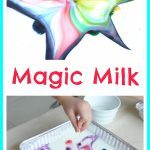 Later I decided to try a bigger version in a vase and used 3 tbs baking soda, 6 drops food dye, 2 tsp glitter and 1/2 cup vinegar. Here’s the video!